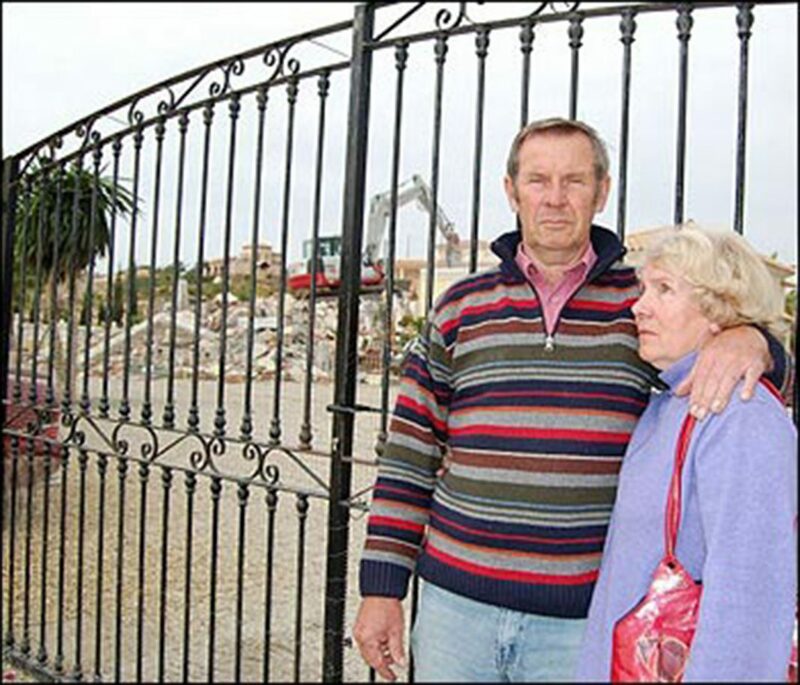 Helen Prior, whose property in Vera was demolished by the Junta de Andalusia in 2008, has issued an open letter in defence of the homeowners association AUAN and its president Maura Hillen in response to a letter, written in English, from the Mayoress of Cantoria, Purificación Sánchez (PSOE), to the English speaking residents of Cantoria (see full text below) in which the Mayoress labels AUAN as “the British PP association” and invites residents to form new associations “that will send us (PSOE) each and every one of your demands”. AUAN has been openly critical of the “lack of action” on the part of the current administration in Cantoria with regard to the regularisation of houses in that town in that last three years of its administration and, at a regional level, has welcomed the backing of the PP and Ciudadanos for a parliamentary initiative to change the planning laws in support of those awaiting legalisation via a town plan. An initiative that was defeated by the PSOE. More recently it has expressed its support for actions taken by the PP at a local level in Cantoria that has resulted in householders in El Fas having access to an AFO, a document which will allow them to register title to their homes after more than a decade of legal uncertainty. Mi husband, Leonard Prior and I, have seen the entry you have made in the Facebook page of the Town Hall of Cantoria where you attack Maura Hillen. As a member of the AUAN for the last ten years I have to tell you that it was not the PP Party that demolished my house and made us suffer so terribly. We trusted Spain and invested our money here, and we had all the permits and did everything we could to comply with Spanish law. Our dream home was demolished before our eyes. Len collapsed and had to be rushed into hospital. We then had to live in our garage for years whilst we spent a lot of money trying to get justice in this country. We have now received some compensation, but not by far what our house was worth. Where were you then? Where was the PSOE? Who insisted that our house be demolished, even though we had all the necessary paperwork? I have to say that, were it not for the AUAN and especially Maura Hillen, who were with us from the beginning, we would probably have had to give up and return to England, abandoning everything in this country. Maura has been brilliant and we are very grateful to her and so are the many people who the AUAN have helped. Puri, you live in such a beautiful country with good people, but sometimes with such heartless leaders. When you attack AUAN you must understand that you attack us. You also attack other people who are still suffering from the planning chaos in Andalucia. You attack people like the Paynes, whose house the Junta is trying to demolish. You attack hundreds of British pensioners in Towns in the Almanzora Valley who, like us, did nothing wrong and who are trapped in a complicated planning mess, unable to get on with their lives. I have to tell you that many members of the AUAN cannot get title to their house and many have embargoes on their properties and could lose them. The party you represent in Andalucia is not helping to resolve this. In Cantoria after complaints from the AUAN you are removing land from the Town plan to allow people an AFO. That is fine, but then why in other Town Halls is your party bringing houses into the Town plan? I have to tell you that it is not the PP party which governs Andalucia where 300,000 illegal houses exist and have existed for many years. The AUAN spent a lot of time and effort to explain the need for solutions for people whose human rights are not respected. An amendment was presented in the Andalucian Parliament and it was not the PP party that voted against this. The AUAN is prepared to speak and work with any party committed to resolving these problems. It speaks to any sensible party, whether they be left wing or right wing, who understand the human and economic cost of all this. The AUAN speaks to everybody and has in the past recognised what your party has done. The problem is that it appears that your party has now turned its back and lost touch with ordinary people, mostly pensioners, who suffer these problems through no fault of their own. Dear Puri, where were you when other houses of British people were demolished? Where were you when we had to march to protest? You now say you have saved 17 houses. The AUAN has saved hundreds. What solutions now are your party offering in Andalucia to resolve all this suffering? Puri, we leave politics to you. The PSOE no longer seems to support the AUAN and it seems that you want to set up an association friendlier to the PSOE. That has been tried by others before. Perhaps you will be successful now, who knows? We and hundreds of other people will certainly continue to fully support the AUAN and its President. I have the need to address the colony of those who have settled in the Almanzora Valley, and especially in the town of Cantoria coming mainly from the United Kingdom, Germany or any other country. I am addressing those who for years have struggled to legalise the homes that they bought believing they were perfectly legal but that lacked any kind of permit or license. They were misled by mayors who at the same time were builders, by legal advisers who at the same time worked for those same builders and who without any scruples led them to a dramatic situation, fearing even the loss of their properties as happened in some unfortunate isolated case. In Cantoria they also built and bought illegal houses and for that reason the mayor of those years, Mr. Llamas García and most of his government team was condemned by the Spanish justice system to long periods of disqualification from holding public office. Some mistake precisely the fact that by continuing to preside over or represent a political party in the shadow, those people have already served their sentences or have been exculpated, but that is not the case. They are convicted and serving their sentences but not in prison. Today seventeen demolitions have been saved in Cantoria and we will not stop until everyone is sure that they will not lose their homes, but it is also important that they do stay calm, it is very important not to be fooled. I feel real terror when I see these days the representatives of AUAN, the association that years ago led the fight for the legalisation of housing, asking forgiveness from their community towards these people, understanding towards the party that represents them and transferring to all the certainty that these people have changed. But that is not the case. They have turned AUAN into the British PP association, but they forget that it was PP mayors who gave both Cantoria and Albox the licenses for the illegal houses. Its president Maura Hillen knows this, she is aware of it, and yet she wants to lead the part of the colony she controls to associate, precisely now, with the political party that is losing the most votes and credibility in Spain. If the colony of citizens of the United Kingdom of Cantoria now allies, for the personal interest of one or two people, whom led them to have those problems, they will be questioning their own credibility as a collective. For years we have struggled, all of us, to find a solution as soon as possible, so that the new foreign-speaking neighbours would have the security that their homes would not end up being trampled on by bulldozers under the protection of an injunction. We have changed laws, we have articulated new ones, and we have provided our city councils with bilingual staff that will allow us to come even closer and be able to form the community that we are today. A community in which we do not care what happens after Brexit, because for us they are already our neighbours and we will defend them as such. And because I want to defend them against a new deception, I warn them of the enormous mistake that would mean trusting again those who led them to have houses that for years have been illegal. To defend them, our new neighbours, I ask you to remember the messages that years ago were conveyed to you by those who are now asking for forgiveness from those who simply swindled you, deceived you and convinced you that your homes were perfectly legal when they were not, but who could not trust the mayor of a village in a civilised country and of the EU? Who would have thought that a legal adviser was playing the game from the opposite side? What has happened to defend the positions of a Labour party today and the conservative party tomorrow? To my neighbours of Cantoria, whatever language you speak, I only ask you not to be fooled, because the wolf will always be a wolf and overnight nobody will domesticate it. I invite you to create new organisations, collectives or groups that will send us each and every one of your demands, but that they do so for their own interests and not for the interests of those who, having solved the crisis of illegal housing, try to find other problems with which to justify their existence. Busy month for the RBL with launch of Poppy Appeal.